“People will always be in need for the art of Yevgeny Alexandrovich Mravinsky for it is warmed with the sacred fire of selfless devotion to the ideal, it knows no compromise, and that’s what its principal value is all about." "Readings of the utmost intensity; no one else has had the nerve, or ability, to play the music this way. The treatment is very Russian: the passions more feverish, the melancholy darker, the climaxes louder. It has been said that the string musicians played as if their lives depended on it. Equally distinctive are the wind and brass timbres; those who heard the Leningrad Philharmonic in performance under Mravinsky say that no other ensemble sounded remotely like it in pianissimo or fortissimo. The sonics are remarkably strong for the time, though a little edgy in the loudest pages. These accounts leap out of the speakers as if they were being played in the here and now." “Yevgeny Aleksandrovich Mravinsky studied at the Conservatory as a student in Alexander Gauk’s conducting class, from which he graduated in 1931. He was immediately taken on as an assistant conductor with the Leningrad Academic Opera and Ballet Theatre and was promoted to the position of conductor with the company shortly afterwards in 1932, carrying on in this role until 1938 and conducting predominantly ballet. In addition he regularly conducted the Leningrad Philharmonic Orchestra from 1934, having first appeared with the orchestra in 1931. Mravinsky rose to national prominence in 1937, when he conducted the first performance of Shostakovich’s Symphony #5. Following the composers official condemnation by the state in 1936, the success or failure of this première would be significant, given also that Stalin’s purges were by now gaining momentum. Mravinsky delivered a powerful and successful account of the new work, which subsequently became a core item in his repertoire. This success also led to a close working relationship with Dmitri Shostakovich: Mravinsky was to conduct the first performances of several more of his symphonies. The next critical stage in his career was his participation in the first All-Union Conductors’ Competition, which was held in Moscow in 1938. In 1938 Mravinsky was appointed artistic director of the prestigious Leningrad Philharmonic at the age of 35. Just three years later Germany ignored the Molotov–Ribbentrop non-aggression pact and invaded the Soviet Union in June 1941. This caused the Leningrad Philharmonic and Mravinsky to be evacuated to Novosibirsk in Siberia. Great relationships between conductors and orchestras are forged by long and intensive periods working together, and during those dark years in Siberia, Mravinsky and his orchestra played in 538 concerts attended by more than 400,000 people, and in addition broadcast more than 200 radio concerts. When they returned to Leningrad in 1944 a very special alchemy had formed between the orchestra and its music director. In 1946 Mravinsky led them on their first-ever overseas tour; 1947 saw them give the first performance of Sergei Prokofiev’s Sixth Symphony in Leningrad, and in 1953 they premiered Shostakovich’s controversial Tenth Symphony. 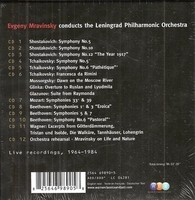 Mravinsky gave world premieres of six symphonies by Shostakovich: numbers 5, 6, 8 (which Shostakovich dedicated to Mravinsky), 9, 10 and finally 12 in 1961. His refusal to conduct the premiere of Shostakovich’s 13th Symphony in 1962 caused a permanent rupture in their friendship. It is a vocal symphony and the texts used did not have the approval of the Russian authorities and they were said to be anti Semitic and did not take into account the previous sufferings of the Russian people. Mravinsky made commercial studio recordings from 1938 to 1961. Disliking the recording process, Mravinsky ceased to make studio recordings after 1961, and up to his death his publicly-available recordings were relatively few. Given this fact and his limited international appearances, it is perhaps doubly extraordinary that his international fame was so extensive: he was regarded throughout the last decades of his life as a master with a reputation of the highest order. His final recording was from an April 1984 live performance of Shostakovich’s magnificent Symphony #12. Recordings reveal Mravinsky to have an extraordinary technical control over the orchestra, especially over dynamics. He was also a very exciting conductor, sometimes changing tempo in order to heighten the musical effect for which he was striving, often making prominent use of brass instrumentation. From all reports, Mravinsky was a tyrant in the Fritz Reiner-George Szell mold. He was a fanatic for meticulous preparation, as demanding of others as he was of himself. One hour before rehearsal was to begin, the orchestra began to tune up; 30 minutes later they sat with instruments tuned, awaiting the appearance of their conductor. Mravinsky was nothing if not a passionate orchestral pedagogue. Even when preparing a work he had conducted countless times, such as Brahms’ Second Symphony, he still scheduled eight rehearsals so as to refine the interpretation even further.